Don't say what I'm doing now is meaningless, I have seen many members talking to me that don't know how to post a picture, so this post I think is quite worth to be done. 1. Take the picture by phone or camera, then transfer it to your laptop. 3. Link to the image in your watchtalkforum post. There is no need to talk about how to take the picture by your phone or camera, or transfer them to your PC, but I will be detailed to explain how to upload the image to a web host. There are many websites that are able to host or store the pictures for you, like photobucket, flickr and so on, I'm personally using photobucket, so today I will use photobucket for this guide. First, and most necessary, you need a photobucket account, which is free, by doing the following you will get one account for FREE. 2. Fill in an email, username and password of your own choice as well as the birth date and verifying, then you are free to process the next step, click the "Get started" button, now your account is completed. There is no confirmation email you will get in the process, but you need to remember firmly about your username and password cause you gonna need them the next time you want to log in your account to upload the picture, the following is the page shows when you done your sign up. 3. And now you go to a page where you can upload the image, click the “upload” button, will redirect to the page with "choose photos & videos", one click on that button, you will be navigated to the folder on your laptop where your images are stored, and select it or double click it, then the image is selected for upload to photobucket, then waiting for the image to be completely uploaded. 4. Click the image just uploaded, and notice the right side of the page, there are some lines of HTML stuff, find the one called "IMG"
5. 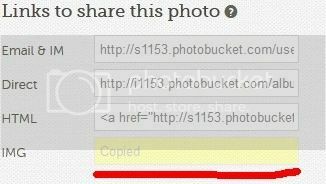 Right click anywhere in that text, when you click, the text will suddenly show up a little yellow box saying "copied" for two seconds, which means you have successfully stored the link to your picture in your laptop's clipboared/memory. 2. And there you go, finish typing your post, insert any other images you like to put in your post, and submit the post. But before submit your post, it's a good habbit to preview your post to make sure everything is all formattted correctly. Ok, that's the end of this guide, hope members don't know how to upload pictures could be enlightened somehow.